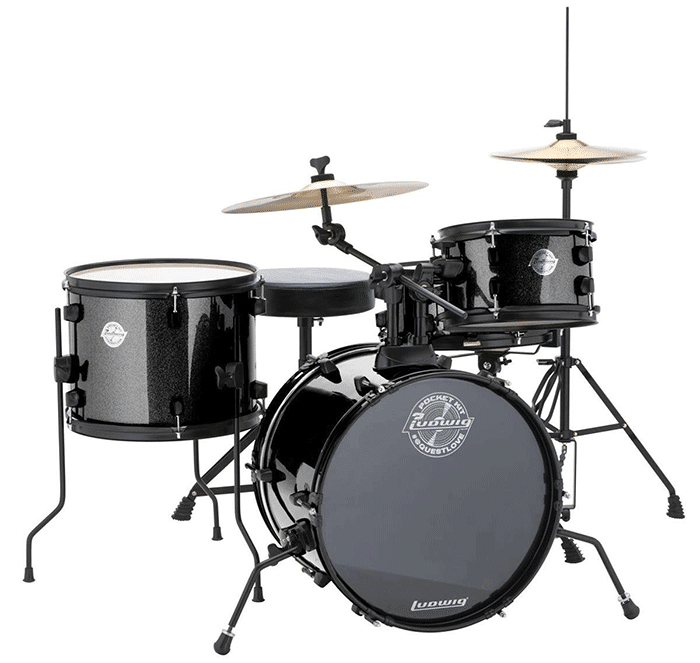 If you are looking for the best drumset you can get for your budget, you’ve come to the right place. Here are the best sounding kits you can get that won’t leave a hole in your wallet. 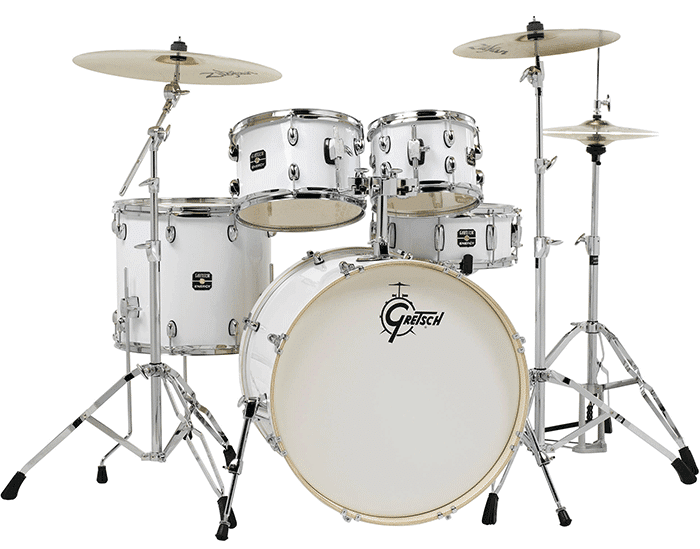 ​Picking the best cheap ​drumset today is very different from picking one 10-15 years ago. The quality of the cheap kits in this day and age are much better quality in terms of materials and sound than they used to be. If this is your first drum set then it’s actually a very important decision in your drumming journey. This one will probably be with you for quite a few years to come, and you want it to sound good enough that it encourages and motivates you to play more. There is NOTHING worse than playing on a piece of garbage and cringing every time you hit a tom or snare. Trust me, I’ve been there. You want it to be fun, and being smart about your purchase choice will get you there faster. When looking for a cheap drumkit you won’t have many options as far as selecting custom parts goes. It’s pretty much just a package deal, so you will have to consider the sound of the set as a whole and think about which sacrifices you are willing to make since everything won’t be premier quality. The heart, soul, and voice of any drum set – the snare drum. To me, a great sounding snare is the most important part of any setup. I prioritize this above all else because if your snare sounds like crap, everything is going to sound like crap. Picking the material of the shell is going to make the most difference in the type of sound you are going for. Wood shells can range from maple, birch, mahogany, bubinga, ash, and poplar. Metal shells on the other hand can include brass, bronze, steel, and aluminum. 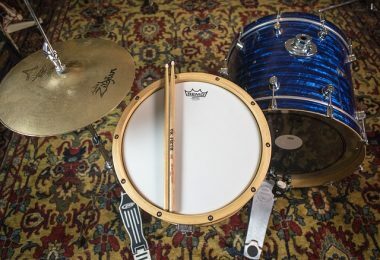 Since each has its own wildly different characteristics, I would highly suggest looking up what kind of snare drums your favorite drummers use and see if you can find a common theme between a few. Or better yet, go to your local music store and play around on a few to see what sounds good to you. Let’s be honest here – the cymbals on a sub-$700 kit are not going to sound great by any stretch of the imagination. You will definitely want to upgrade these down the road. However, in the theme of staying on a budget and not upgrading right away, you will want to pick a set that comes with cymbals you can tolerate. Cymbals are most commonly made out of bronze, but some beginner level cymbals are made of brass to keep the purchase price low. You should try to avoid these because they will not sound good at all and will ultimately hinder your motivation to play. It’s also good to take into consideration what type of music you like to play. Planning on playing some hard hitting metal/rock? Try to aim for heavier cymbals so you don’t risk cracking them. 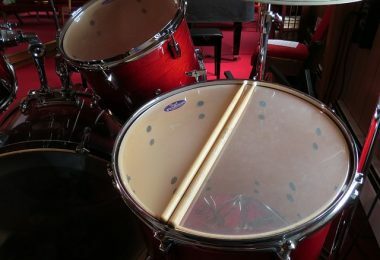 While it’s true that the toms and kick make up the majority of your kit, the sound can be modified so drastically from different drum heads, tuning, muffling and so on, that as long as you can listen to a video of the kit being played and not be appalled by the sound, you should be fine. The big thing to pay attention to other than the type of wood is the build quality. You want this thing to last a long time so make sure to read through as many reviews as you can and look out for people complaining of things like warping over time. Luckily for you the kits I picked below all have very sturdy and nice sounding toms/kicks. On to the list of the best cheap drumset! Designed by the Roots’ drummer Questlove, this premiere entry level kit sounds incredible. It’s technically a drum set designed for kids ages 4-10, but don’t be fooled! This can certainly be played by adults and you’d be crazy to overlook it. Sometimes small things come in great packages and that is definitely the case here. Not only is it really cheap, but it’s all-inclusive. There is nothing that you need to buy for this kit and it even comes with a video tutorial to help with assembly, tuning, technique, and lessons. One huge benefit of this kit is that since it’s designed for kids, it is extremely portable and takes up very little room. On top of that, it sounds GREAT. This is a perfect contender for the #1 spot when it comes to the best low-cost drum set. Available in white sparkle, black sparkle, and wine red. I was debating for a long time between the Imperialstar or the Pearl Roadshow for this list. Even though the ​Pearl drum set is about $200 less I picked the Tama because I was blown away by how good it sounded. It also just so happens to be one of the best drum set brands out there. 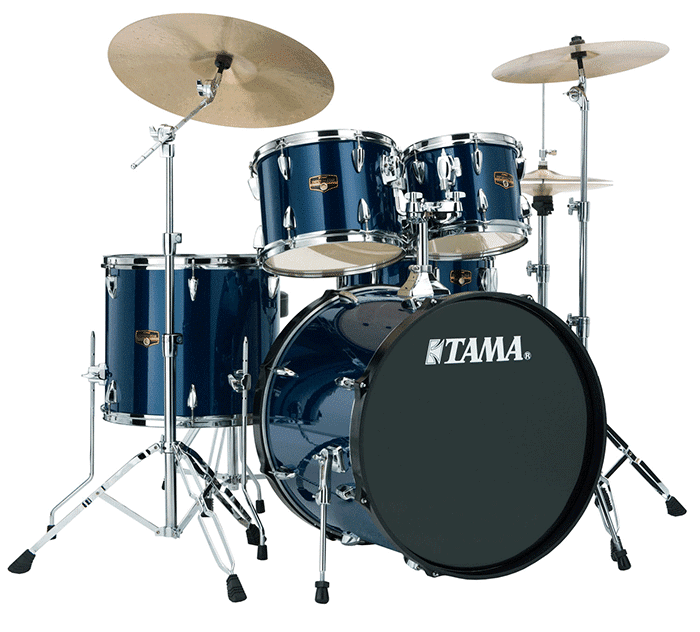 The Tama comes with a quality set of Meinl HCS cymbals — 14″ hi-hats, a 16″ crash, and a 20″ ride. It’s a fully outfitted 5-piece kit, and it usually comes with a cymbal pack of varying brands depending on where you purchase it. They aren’t going to be the best cymbals by any means, but at least it comes with some unlike a lot of kits. 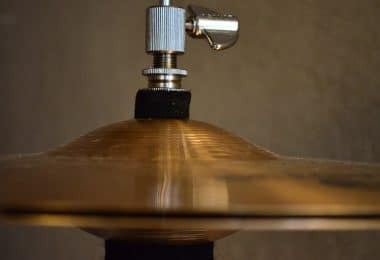 Toms are mounted from the cymbal stands – one boom and one straight – via ball-mount tom holders that clamp to the stands. This allows for infinite possibilities when it comes to positioning the toms – a huge plus. The best part is that the wood snare sounds really great straight out of the box – much better than the tin-can sounding metal snare drums that come with the majority of drum kits. All together it’s a great option for a kit you can build upon and upgrade for years to come. Although double the price as some of the other kits on this list, it's definitely a top contender for the best cheap drumset, and in my opinion it's the best starter drum set for adults. You probably weren’t expecting an electronic drum set on this list, but it’s on here for good reason. Besides the low price point, the sound possibilities are endless. 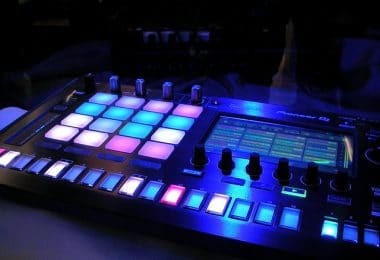 On top of the hundreds of percussion sounds, 40 different kits, and 60 built-in play-along tracks, you can hook it up to your computer via MIDI cable and fully unlock it’s potential. 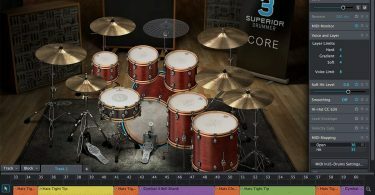 Launch it along with a program like Superior Drummer 3 and you have thousands of professionally recorded sounds at your fingertips. My favorite part about using an electronic kit is that it’s silent (well…mostly) when played through headphones. If you live in an apartment or have angry neighbors, going the electronic route might be the only option for you. It’s not a bad option at all! As a bonus, recording with an electronic drum set couldn’t be easier. No fiddling with microphones and tons of wires. Just plug in, hit record, and away you go. Electronic drum sets can get pretty expensive, but the Alesis Nitro is the exception. It’s very well known for being sturdy and it comes with high quality rubber pads which can help improve your dynamics. This is a great beginner electronic drum set. 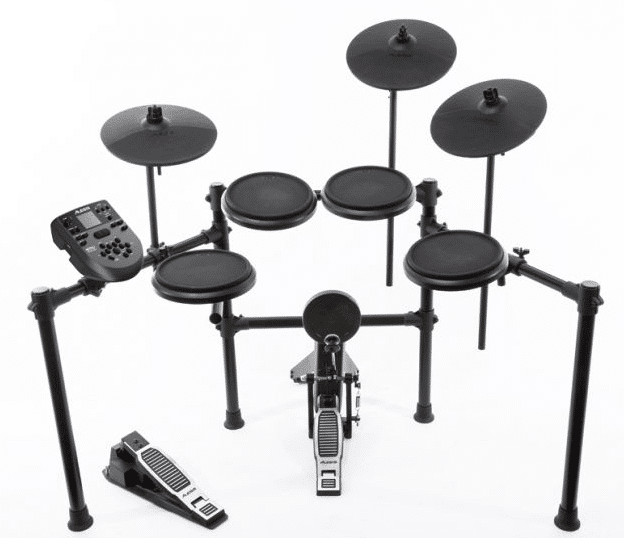 If you are interested in checking out some other options for electronic kits, check out our review article on the best Roland electronic drum sets. The first and best upgrade you can possibly get for your drum set is a new set of drum heads. They will seriously transform your sound more than you can imagine. There is a whole world out there to dive into when it comes to heads. From coated, to non-coated, to muffling options, the possibilities of sounds are endless. Since cymbal preference is going to vary based on what kind of music you play, I would highly recommend seeing what your favorite drummers use. Everybody is going to have different opinions on this one, so you really need to experiment around and see what sounds best to YOUR ears. From there I would say go ahead and expand your toms. Start with a really small 8-10” for the high end, or go the low route and get a nice big 2nd floor tom. Being able to expand your options when it comes to playing will inspire you to try new things and open up your creativity to new levels. 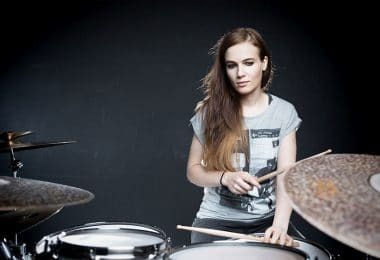 To wrap things up, picking the best cheap drumset really comes down to what your specific needs and tastes are, but you can rest assured that there are plenty of options out there and there will always be something you can do to make it sound great. Try to figure out what style of music you will be playing the most and narrow it down from there by picking kits that are suitable for that style of music. Your whole goal should be to pick a solid foundation that you can build upon and upgrade for years to come. Choosing a drum set is a very personal and exhilarating experience, and there is no greater reward than finally getting it setup and being able to jam out! If you want to see a list of some more premium drum sets check out our article on the best drum sets you can buy.